Since 1982, Mitsubishi has continuously delivered bold Shogun models each more cunning and sophisticated than the last. 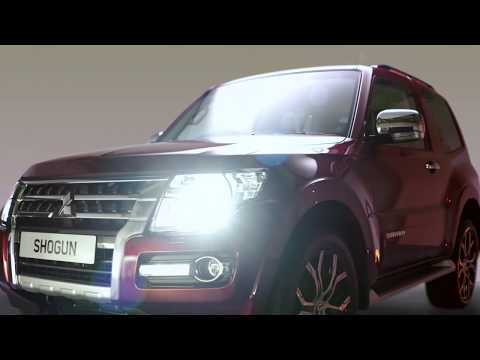 This time they have developed a 4x4 that breaks the mould and dares to achieve what others can only dream of, by creating the ultimate off-road vehicle, the Mitsubishi Shogun. Not only is the cabin of the Shogun spacious and comfortable, it has also been combined with the latest technology to create a driving experience like no other. Look no further than the steering wheel and drivers will discover the finest of Mitsubishi engineering. With Audio Controls (positioned on the left hand side), Cruise Control (placed on the right) and Bluetooth Hands Free Mobile Control (fitted on the lower section of the wheel), drivers have an abundance of choices to make their journey more pleasurable, without even removing their hands from the steering wheel. The MMCS (Multi-Media Communication System) located on the centre of the dashboard delivers a 7 inch touchscreen system with a wealth of options. The system accepts SD cards up to an impressive 32GB, accurate Satellite Navigation, Reversing Camera and Parking Sensors. The MMCS keeps drivers connected, updated and entertained in true Mitsubishi style. An impressive feature in the latest model is the Rockford Acoustic Audio System. These high quality speakers situated in the cabin, with a subwoofer mounted in the trunk provide an exceptional listening experience. With a design so intelligent, it adjusts the volume according to the speed of the vehicle to block out any interfering noise. At first glance, drivers will be immediately captivated by the slick, aggressive styling of the model. The brave design reflects the energetic and robust character of the Shogun as it can tackle any terrain and all weather conditions with incredible ease. The Shogun remains composed through all testing encounters as it has been equipped to deal with all possibilities. Each model comes complete with LED Daytime Running Lights that operate automatically when the vehicle is started providing improved visibility for drivers during daylight hours. Additionally HID (High Intensity Discharge) Headlamps have been installed to drastically enhance road visibility and give drivers more time to react against possible dangers. Headlamp washers have also been added to ensure that lenses are spotless ensuring maximum lighting. The tough exterior of the Shogun demands respect and remains durable so drivers can explore with confidence. The Shogun is powered by an impressive 3.2 litre direct-injection diesel engine. This powerful 4-clyinder engine has a double overhead camshaft, turbocharger and intercooler. The engine has been manufactured to provide serious low-down torque but will never lose power in the mid-range. The refined engine is now far quieter than previous editions as well as being more fuel efficient. Mitsubishi have installed an engine that is cleaner and more economical than any other 4x4 available on the market. The improved engine is far superior in performance which results in greater towing capacity and 0-62mph statistics.